Eva Sawyer’s fascination with the English Tudor period led her to produce a unique Lenormand deck – the Tudor Lenormand. The Tudor Lenormand is a mixture of photographic, classic painted images, and modern illustrations that (mostly) represent or express in some way the Tudor period. King Henry the VIII, for example, is #28, Man; a princely looking boy (possibly Henry?) is #13, Child; The Tower of London is, not surprisingly, #19, The Tower; a Tudor-period woman reading a book (one of the wives?) is #26, Book; a marble effigy- sarcophagus is of course #8, The Coffin, to give just a sampling. The cards are borderless and poker-sized (2.5” x 3.5”), the standard for lenormand decks, and comes in a handy plastic box. The card stock is good, with a smooth semi-gloss finish, making it easy for shuffling, and the print quality and color are crisp and bright. Each card is numbered and named and has the playing card equivalent symbol in the upper left corner. The card backs display the red-rose-and-crown Tudor family crest set against a beige background with the deck name in cursive script on the bottom. This deck is appropriate for any level of lenormand reader, from complete novice to advanced. The images are simple and clear, and with each card numbered and titled, there’s no guessing as to what it is. I would, however, have liked a little background, or clarification as to what some of the historical images in the deck are – a brief, 1-page downloadable list would suffice for this. This omission will soon be corrected, though; they are apparently working on a full color PDF with information on the historical aspects of the deck and are also producing a companion paperback book for release in early 2016. These are sure to enhance the appreciation and use of the deck. I also found the mix of unaltered, realistic photos on some cards and fragments of paintings or illustrations on others a little bit jarring (rather than the style being consistent throughout), but that just might be my personal sensibilities and preferences and not a weakness of the deck. The Spiral Tarot is one of those mass-market decks that prove you don't have to spend a small fortune to get originality and beauty. Each 2.75" x 4.13" colorful card is a gorgeous painting full of mythical imagery with a Celtic slant; the Majors display astrological and Kabbalistic symbols, the Minors are fully illustrated. All follow the commonly understood RWS interpretations, so it is suitable for advanced as well as beginning practitioners. The LWB that accompanies the deck is definitely little, though useful, especially for beginners; it offers a Celtic interpretation for the Court cards, which adds interest and dimension and briefly discusses numerological significances . I'd had this deck on my "wish list" for ages, but somehow never got around to getting it. For a reason I don't recall, I checked out the images on-line again recently, and was zapped by their beauty. I ordered the deck right away when I found it listed for a modest price and received it within days. As soon as I viewed it, I knew this will be one of my regular working decks. If you're thinking about getting an interesting, beautiful and inexpensive new deck, don't hesitate, grab The Spiral Tarot! The Inner Wizard is an 84-card oracle deck collaboratively created in Israel by artists/teachers/writers Jacob Roth and Libby Ram in 1999. It has recently been revised, redesigned and translated into English by artist Orna Ben-Shoshan. The cards are of glossy, thick paper and the box is sturdy and compact. There are distinct differences between The Inner Wizard and other oracles I’ve worked with. One is the deck is not visual; rather, it is text-only on colored backgrounds. Each card presents a written message on one side as well as an astrological sign, and an affirmation (or what Ben-Shoshan calls a “renewed choice proclamation”) on its flip side. This may be a plus for some and a minus for others. The next difference is the deck’s unique square shape and smaller size, measuring 3” by 3”. While the cards are nicely compact, I found their square shape difficult to shuffle and eventually gave up trying and instead stacked and re-stacked them to mix. The Inner Wizard of the title refers to one’s higher self as well as “healing angels” (as described in the brochure) or even God, (depending on your belief system), so messages are written in the 2nd person, that is, they are addressed to “you” the querent, and are often “signed” by one of the above or others, like “Inner Goddess,” or “Your Divine Child,” or even “Your Mouth,” or “Your Computer.” (I must admit these last made me crack a smile!) The meanings of the astrological archetypes written with the messages are found in the brochure. These consist of “Reinforcing features,” and “Weakening features,” and are to be read along with the message on the cards for deeper advice. The deck’s messages are either positive advice or admonitions regarding current beliefs or behaviors, paired with an always positive “renewed choice proclamation” beginning with “I consciously choose…” The proclamations encourage one to put into action the advice given by reinforcing it with a succinct phrase, such as “I consciously choose to connect to my intuition,” “…to believe in myself,” or “…to connect to deep serenity.” Sometimes, however, they are less uplifting, such as “I consciously choose to identify my inadequacy,” or “…to express frustration, anger, etc…” This is also the case with the messages themselves; most are positive and soothing, such as “Be gentle with yourself, put aside your criticism, forget your mistakes, remove all traces of shame and blame from your heart…”, “...Let yourself relax. Do nothing – just be…” However, some carry very specific messages that will likely not apply to everyone, or even a high percentage of querents such as “...By starving yourself you are destroying a perfect piece of art...,” or “Life is very difficult lately… you search for love among your friends, but they tend to keep away, and you feel angry and betrayed…” That said, I did find most of the messages to be universal and applicable to anyone. As to suggested methods of using this deck, the brochure suggests a 1-card draw for daily contemplation or as a response to a specific question, or a 3-card predictive draw as an “unfolding story,” of past-present-future. I found the best result to be the 1-card daily draw, which offered a fresh perspective for each day. The deck was less effective in answering a specific question, and worked not at all for me as an actual oracle of 3 cards. The astrological correspondences didn’t seem to add much to the messages as well, though I found the keyword descriptions of each sign accurate and useful in themselves. For some, they may indeed provide reinforcement and deeper insight. The Inner Wizard will have appeal to many people, but it’s not for everyone. As a visual person, I missed the imagery I love in tarot and other oracles and the expanded awareness and deeper insight that such artful imagery can stimulate. Some may find repeated references to a God and divinity off-putting as well; I am one of these. However, if you’re looking for a clear, no-nonsense insight tool to work with and the above points aren’t your issues, you’ll certainly enjoy The Inner Wizard. The Inner Wizard is available at KabbalahInsights on Etsy, as well as through the Kabbalah Insights web site. What a gorgeous deck this is! I was instantly attracted after viewing some on-line samples, especially but not limited to the card on the left, The Sun. The Sun is my favorite card in every deck for its positive meaning, and it is also my Personality card. Sunflowers are just about my favorite flower too, so the St. Croix Sun card is a winner for me. This card is also the cover of the sturdy box the cards come in and seems to beckon. It is a very good indication what the rest of the deck will be like - warm oranges all the way through, with rich contrasting blues; the deck is vibrant and glowing, the images joyful and haunting at the same time. The artist Lisa St. Croix's New Mexico home seems to emanate from the cards; you can feel the warmth and glow of the desert landscape. Readings I've done with the deck were spot on. The LWB (Little White Book) written by Lisa that accompanies the deck gives brief, but interesting interpretations of the cards, which largely follow the standard RWS versions. This deck, though, is multicultural, and includes Native American, Buddhist (the Dalai Lama is The Heirophant), Hindu and Polynesian figures and even Lisa herself! The card stock is average thickness, with a glossy finish, and the colors are rich and vibrant. All in all, Tarot de St. Croix is a wonderful deck - uplifting, beautiful, and yes magical too! Highly recommended - get it just for the art alone! It can be purchased directly through Lisa de St. Croix's website or from Deverra Publishing. 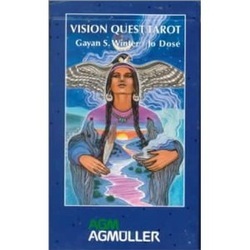 Vision Quest Tarot isn't new, yet having only recently started working with it myself, I feel it is well worth a plug here. To put it simply - I love this deck! The Native American theme is what attracted me initially and I also liked the artwork of the sample cards I viewed online (no small thing if you read my blog). I had no idea how deep and profound it would be, thanks especially to the excellent accompanying Little White Book (LWB) by writer Gayan Silvie Winter. While ﻿the ﻿imagery is well done, evocative, and lovely in itself, referring to the LWB adds a whole new dimension to any reading and is essential for receiving the full benefit of the deck. Like the recently released Chrysalis Tarot (reviewed below and discussed in my blog), Vision Quest was created to offer a transforming and healing experience. Winter's introduction to the LWB states the deck "is designed to increase our awareness of cosmic forces and how they influence our individual paths." It only partly follows traditional meanings (more Thoth than RWS), altering and/or expanding and deepening them – offering a positive, transcendent approach to every card – without diminishing or distorting the lesson or the message. A number of the card names have been changed, such as Chaos for the Tower, Integration for Temperance, Vision Quest for the Hanged Man, Shaman for the Hierophant, but these are clearly indicated, with the traditional name written under the new one and should not cause confusion. The suit name changes are obvious – Fire for Wands, Water for Cups, Air for Swords, Earth for Pentacles and their respective card imagery is listed at the beginning of the LWB. The cards are of average tarot size and the card stock is strong and slightly glossy (which I like). The card backs show a multi-hued night sky with a single bird soaring upwards against a spread of stars, capturing, I think, the message and orientation of the deck. "STRESS – quarrel, disagreement, power trips, agitation, ambition, competitiveness: Inner Message - When an onslaught of some kind has thrown you off-balance, turn your attention to what goes on inside. Emotional stress and pressure you feel coming from outside are actually manifestations of the quarrel that takes place inside you when dueling values and beliefs clash. Outer Manifestation - Life reflects what goes on inside you at any given time. If daily life causes too much stress and anxiety, stop and take a moment to find yourself again. Fighting will only cost you more energy. Remember there is a very private room inside, filled with peace and calm. This sanctuary always remains open to you." The image of this card shows five hands holding flaming torches against purple hills, dark turbulent clouds and lightening striking in the distance. Its keyword, Stress, as in all Vision Quest cards (except for Aces and court cards), is written under the card name. The image is atmospheric and dramatic, evoking the feeling of emerging friction and explosive energy, the essence of the card. Vision Quest Tarot succeeds as a tool for inner exploration, healing, and spiritual illumination and in these difficult times, it can serve as a much needed wise and gentle friend. Highly recommended! It is easily available from Amazon or any retailer for a very affordable price. There are many unusual spreads throughout the book, like the Alice in Wonderland Spread (to shed light on your personal life); Hidden Desire Spread (guide to an expression of deepest desires); Mermaid Magic Spread (to unleash magic in your life); Georgia O’Keeffe’s Activate the Muse Spread (enhance creativity); Peter Pan Spread (accessing your inner child); Haunted House Spread (to discover the story of a place and clear the energy); Salome’s Dance of Seven Veils Spread (discover how to fulfill your heart’s wish); Procrastinating Spread (will get you moving if you’re stuck); Dr. Seuss’s Feeling Grinchy Spread (to work yourself out of a rut) and many more fanciful titles to choose from. Not all the spreads worked for me, however. While I found a large number intriguing, with meaningful and useful questions, I also found a number that contained what I felt were silly or frivolous questions. For example, in the Change Your Situation Spread, which explores options of change, question #2 asks, “Have I given this serious thought?” In Peaceful Night’s Sleep Spread question #3 asks, ”How can I wake at the same time every morning?” (An alarm clock might be a good answer here!) In the Make Up for Wrongdoing Spread, question #1 is “What did I do?” The Get Out of Debt Spread doesn’t work for me as a whole with obvious questions like “How much debt do I really have?” and “Do I use my credit card to pay for basics?” “Do I buy things I do not have cash for?” “Do I lie to others about what I spend money on?” I for one don’t need tarot to answer those! While the entire 365 tarot spreads in this book aren’t perfect, there are so many alluring ones to choose from that it’s easy to find more than enough that will resonate and work well. There’s something here for everyone and every situation and it’s an enjoyable adventure delving into the array of spread possibilities. I recommend 365 Tarot Spreads for both spread collectors and general tarot enthusiasts alike; for everyone who enjoys working with their decks in novel and innovative ways. 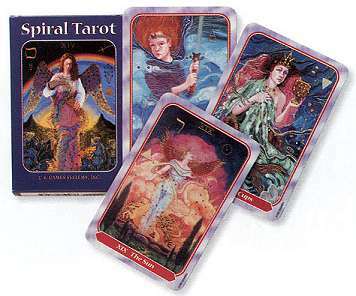 365 Tarot Spreads is a welcome new addition to the tarot library. The deck changes the names of the four suits and the court cards, though that isn't problematic in itself. My biggest observation (rather than complaint) is that some of the artistic renderings do not follow the mainstream Rider-Waite or do not clearly express them, and so the Little White Book (LWB) is essential for full understanding of the deck. A simple example is The Sun card, which has a tear falling from its eye. I wondered why, as The Sun in RWS is one of the most positive cards in the deck. Looking in the LWB, I read that "...Sun sheds a fatherly tear because so many of his children neglect beauty, truth and justice in favor of materialism, power and dogma." It goes on to say "... even a lamenting Sun is an excellent card to have in your reading." So it does follow the traditional meaning in fact, though you wouldn't quite get that just looking at the card on its own. There are a number of other cards where the meanings are difficult to deduct from just looking at the cards - take the 6 of Spirals (Wands), which in Rider-Waite shows a person riding clearly in triumph amongst a crowd. In Chrysalis, there are six decorative flags hanging from a tree with the sun in the background. Not a clear presentation of the core meaning of this card; if I were a beginner, I would have to definitely look in the LWB for clarification, which does note this is a card of success. So the deck doesn't so much deviate from the meanings of Rider-Waite as it doesn't quite clearly express those meanings in all of its depictions.